This adorable little bag has such a great shape. It’s taken some inspiration from a classic north-south tote and restyled it to irresistibly detailed effects. Tapering towards the top, it’s got the same of appeal as a bucket yet it’s totally different. Any bigger and you might find yourself losing things; this size is ideal. It’s small, but a small bag is big enough if you don’t have young children and all their gear, or you need your tablet with you, or a change of shoes…I could go on. I mean, you know this isn’t a bag you’re going to live out of, but I’m used to cutting down. I’m all about the bare essentials! Don’t be deceived: the rings the strap clips to are decorative. I like it when hardware serves both a functional and aesthetic purpose, which should always be so. I’m not a fan of extraneous hardware, but I’m willing to let it slide because this bag, in navy, aubergine, or hot pink, is such a great frugal score. For those of you waiting for more updates on Furla’s new Sunset Candy since I blogged about it in March, here’s more information. To be released in Singapore on 23 May 2013, you’ll find not one, not two but four different color combinations guaranteed to make your decision-making process a tad more difficult. Available in a quartet of delicious summery hues, each sorbet-coloured bag is carefully crafted with specially-sourced rubber that is free from phthalates (obviously, that’s a good thing). Priced at SGD790 each, it’s the perfect addition to your existing collection of Candy bags, or a great one to get if you’ve been a fan for a while but couldn’t decide all along which colour to get. Because with the Furla Sunset Candy you’ll be guaranteed a gradient of beautiful hues that’s just perfect for use on the weekends. Tea with girlfriends. Shopping in town. On the beach. Or by the pool. You get the picture. One more thing. If you’re looking to get a shoulder strap from Furla to use with yourCandy (click here to see the strap), you’ll be pleased to know that they can be bought for SGD139. 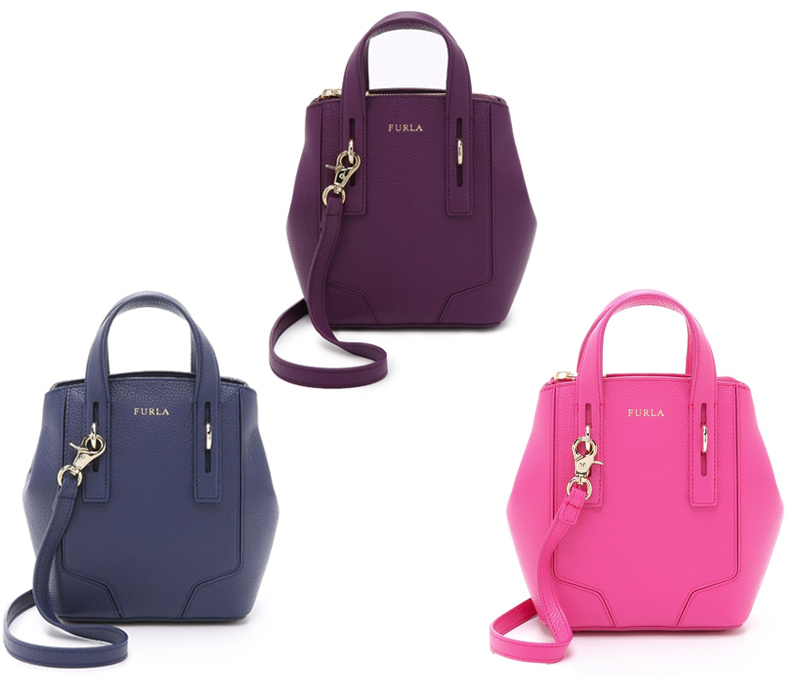 Comes in a few colours and available at Furla boutiques islandwide. Kicking off officially this Thursday is Furla’s much-anticipated Candybrissima Show Tour, which has already travelled the world and will be making a stopover in our sunny island, its 11th stop, to be exact. To be held over two days (24 and 25 May) at Paragon Atrium, it’s a celebration of all bags Candy, by far Furla’s most popular to date with a cult following of its own all over the world. Besides the fact that you’ll be able to purchase the new bags from the Furla Sunset Candy collection (SGD790 each), along with its tinier new sister, the very adorableCookie (SGD455) which comes in sweet pastel hues for the season, there’s also the Candybrissima Creative Laboratory. Specially set up just for this event and open to the public from 24 May, it will showcase a variety of Candy bags interpreted by various personalities, as well as allow you to experience first-hand the joy of putting together your very own Candy bags with all manner of embellishments and charms. I’m also giving 3 Furla Cookie bags away (that’s the Candy‘s tinier, more adorable sis). Simply head down to Paragon Atrium (either Friday or Saturday) and customise your very own Candy at Candybrissima Creative Laboratory. Once you’re satisfied with your creation, take a snapshot of it, upload it onto Instagram with hashtags #furlacookiesg and #iwantfurlacookie. The 3 most fun/crazy/creative entries (as decided by me) will win a Cookie each. It’s that simple! Don’t forget to leave a comment in this post once you’ve taken part (and include the Instagram URL if you can) and make sure your account is not set to private so that I can view your entries. Have fun, and good luck! Furla’s answer to the tiny sling that’s all the rage these days is the Mini Crossbody Metropolis, a recent addition to its ever-evolving collection of bags. Small to a point but not nearly as minute till it becomes redundant (it would fit an iPhone6Pluscomfortably, with an extra-wide base for more bits and bobs), its saving grace are the details it comes with, from the slinky chain sling to its assertive lock clasp, which some might say looks similar to the M _ _ _ _ S from M _ _ M _ _ . But unlike the one it was compared to, the Mini Crossbody Metropolis that measures some 17 cm by 13 starts from just SGD505, which makes it more affordably-priced and good for those who just want a fun party bag they can possibly ‘ruin’ without too much heartache. Now available at Furla boutiques locally, you can pick up the one that comes in the floral print or in metallic gold, along with many variations on offer, from some in faux ponyhair to others in grained leather that come in Black or Cabernet-Red. There aren't many brands that hit the sweet spot of delivering good value for your money without becoming wildly overexposed, but somehow, Furla has managed to do that for years. The Italian brand's bags are sophisticated without being stuffy and they hit at a solidly "contemporary" price point, which makes Furla an ideal place to find both a work bag and a cute little weekend option. Either way you go, the piece you choose won't be something already in the closets of everyone you know. Check out our photos below, and to shop Furla's current offerings, head over to Shopbop orBloomingdale's.